So on Friday I had to make cakes for the office, more specifically I had to make cakes that I would be judged on (not officially, but you know, it’s competitive). Decision, decisions. What to choose? Where to start? Now I think I’m not too bad in the kitchen, I can whip up fresh pesto (kale, natch) and make some decent scoff when required. I have my trusty gadgets (pestle and mortar, Magimix, etc), but when it comes down to baking out comes the stalwart of my kitchen, the Kenwood Chef. I *think* am the third generation of my family to use it. It was certainly my mother’s and possibly her’s too, at least that’s what I have been led to believe. Sadly my mum is no longer around for me to corroborate this information, and much as I love my dad, I’d get a more reliable reply from the neighbour’s cat (sorry dad). The Kitchen Aid (seen on TV shows, various) at first seems the much more aesthetically-pleasing model, with its clean, retro design. The more modern Kenwood models certainly look great and I’m sure their performance is outstanding. 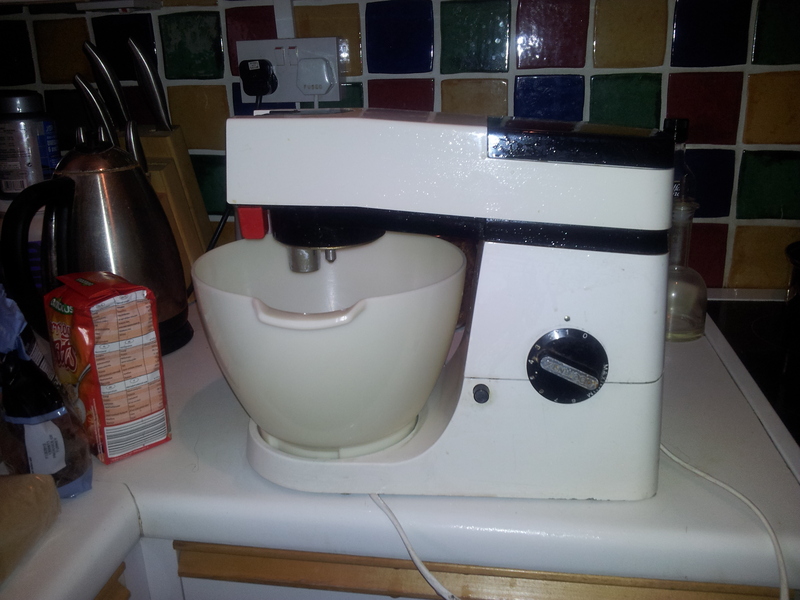 But for genuine vintage you can’t beat the workhorse that is my Kenwood Chef, not least that it certainly looks vintage. Never mind that it sounds akin to a Boeing 747 approaching take off (I fully expect to turn around in my kitchen and see a man with ear muffs, doing semaphore). I’m also a little afraid that the dial might come off in my hand, that the machine will continue to gain speed and momentum and eventually career off the work surface and plunge to the floor. The dial does, sometimes, come off, but pops right back on – albeit with the numbers slightly out. She is like an old, eccentric relative, you never know quite what to expect, but I’m inordinately fond of her; most of the time she behaves impeccably, and afterwards I wonder what I the fuss was about. I suppose it is almost an extension of family given that more than anything it reminds me of how I ‘learned’ to cook, by baking cakes with my mum, bending over the mixer, trying to breaking eggs into bowl whilst the beater was still going and usually leaving a certain amount of eggshell and a scene of utter devastation in my wake. The Vikings had nothing on me. Most of us have memories of our first forays into the culinary world: Me, covered in flour and wrapped in an apron folded so often that I could have passed for a Geisha. This is the reason I chose the lemon drizzle cake – from Nigella Lawson’s How To be A Domestic Goddess, it’s a particular favourite chez Wurzel. Preheat your oven to 180 C/ gas mark 4. Butter and line your loaf tin well. Cream together butter and sugar and add eggs and lemon zest, beating them in well. Gently fold in the flour and the salt, mixing thoroughly and then add the milk. Spoon the batter into your prepared tin and bake for 45 mins or until cake tester comes out clean. For the syrup: Put the lemon juice and icing sugar into a small saucepan and heat gently until the sugar dissolves. As soon as cake is out of oven, puncture all over with skewer and pour over the syrup. Leave cake to cool completely before removing from the tin. For the glaze: Combine lemon juice and icing sugar until smooth and white, add a little more icing sugar if needed. Make sure your cake is completely cool before drizzling with the glaze. Thankfully the associations (at least for me) with cake, and most people’s I’d wager, are all good. Comfort, home and most of all, my mum and, by association, the Kenwood Chef is included in that (I have also inherited her Le Creuset casserole dishes, but that’s another whole story!). I am sure that many other keen cooks will understand the attachment to equipment handed down from family members. 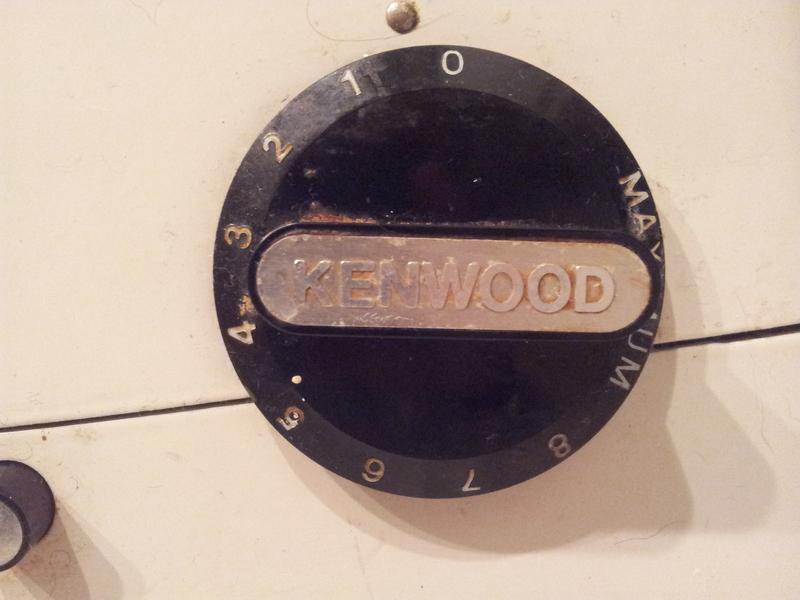 I know that when my Kenwood Chef, Grande Dame (for she is a lady to me) of the kitchen finally goes to the great cupboard in the sky, there will not just be a need for new mixer, but it will also be the end of an era. Thankfully I will still have those memories. What’s that you hear? Yes, that’s right it’s the world’s smallest violin. But I digress. What to do? DIY? I think I need regroup of that one. The hallway redecoration project has gone spectacularly off piste. What started as a simple painting job has descended into major works, after I decided to pull some loose paper off. It’s coming off in sheets and now my walls are looking like something out of Homes under the Hammer. Before not after the makeover. Polyfilla will be doing very nicely out of me thank you. Everytime I look at it, I want to lie down in a dark room – and let’s not even mention the bathroom. Can of worms. decided to make some soup – yes wholesome nutritious and cheap. Unfortunately it tastes pretty rank due to the fact that I whizzed the vegetables up too fine and each mouthful is akin to eating damp sawdust with a hint of bacon, just remember to keep the vegetables chunky. But hey it’s healthy and did I say CHEAP. One success I can share is Dan Lepard’s Clementine and Oat muffins which is in his fabulous new book, Short and Sweet, utterly divine. Sadly they didn’t look as pretty as they should so there’s no picture. 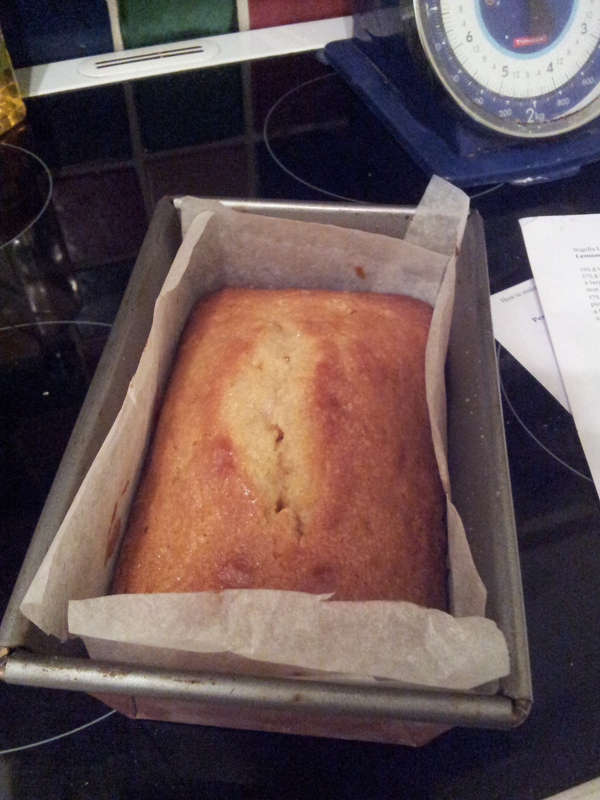 That’s what I shall do, practice baking……perfect for a dank, November afternoon! share my exciting new finds with you so you can do it on my behalf. I can live vicariously through you all. Here’s one to whet your appetite…. week. See don’t say I don’t give you anything.